Slotted rail mounting systems, like Weaver and Picatinny, come standard on nearly all modern rifles. These rails play a big role in the modularity of AR-15s, and like many great firearm advancements, are a blend of military need and civilian ingenuity. Based on appearance alone, it can be difficult to distinguish between the two. This has led to a lot of confusion regarding compatibility, and begs the question, why? Rather than seeing them as competing products, view Picatinny as a refined and improved rail design. The Weaver rail was invented by William Weaver, owner of sight company W.R. Weaver Co. which was founded in 1930. His rail was the first step towards an interchangeable standard, as most mounts before his were specific to each gun or optic. The Leupold mount, which had been popular at the time, was attached directly to the receiver with a set distance for ring spacing. This made the mount very stable but offered no flexibility for users with scopes that required different rings or a different ring distance. Weaver’s system made it much easier to mount scopes of varying types. He also sold his optics and mounts for much less than his competitors, which aided the popularity of his design. Initially Weaver rails were made in two pieces, with one at the front of the receiver and one at the rear. 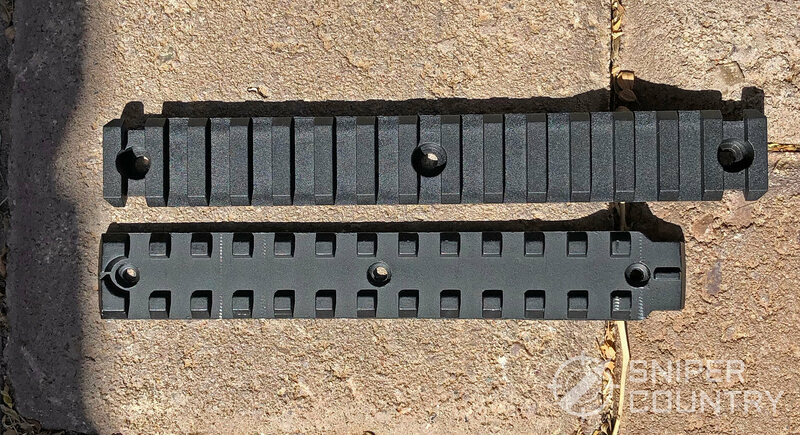 It made scope mounting more time consuming when compared to a one-piece rail design, because both rails had to be perfectly aligned for the scope to be accurate. It was an acceptable sacrifice though, as this left the bolt opening exposed so that cartridges could be inserted more easily. At the time, most rifles had internal magazines that could be fed with striper clips, or with one round at a time if the clips weren’t available. The shooter could also use that method to top up their magazine after firing a few rounds. A telescopic sight installed usually prevented the use of striper clips, but the opening made by the two-piece rail meant cartridges could be still be fed individually without much interference. Once detachable magazine fed rifles rose in popularity, one-piece weaver rails began to replace the two-piece design, which made mounting and sighting in a scope a much quicker process. In order to be considered a Weaver rail, the rail must have a recoil groove length of .180”, but there was and still is no requirement for the distance between each groove. As a result, you end up with rails like the two pictured above. This may seem like a major oversight on Weaver’s part, but it’s important to remember that Weaver’s company was dedicated to telescopic sights. It’s very possible that when he originally designed his mount, he hadn’t planned on it being used for anything aside from optics. He probably didn’t foresee the rise in attachment options either, since at the time not much else was normally attached to a rifle. Eventually the benefits of a rail-based system were known, and his rails were adapted for use with bipods, lights, lasers and all the other accessories we have today. That may seem like a perfectly fine way to do it, but if we take a closer look at the rail variations these applications created it becomes easy to see why Picatinny rails came to fruition. The rail pictured here is a typical Weaver rail that would be found on the top of a modern bolt action rifle’s receiver. The raised portion between the recoil grooves is noticeably longer than they would be on a Picatinny rail. These longer segments reduce the available recoil grooves to mount a scope, leaving only two or three positions, but increase the surface area that the scope is in contact with. 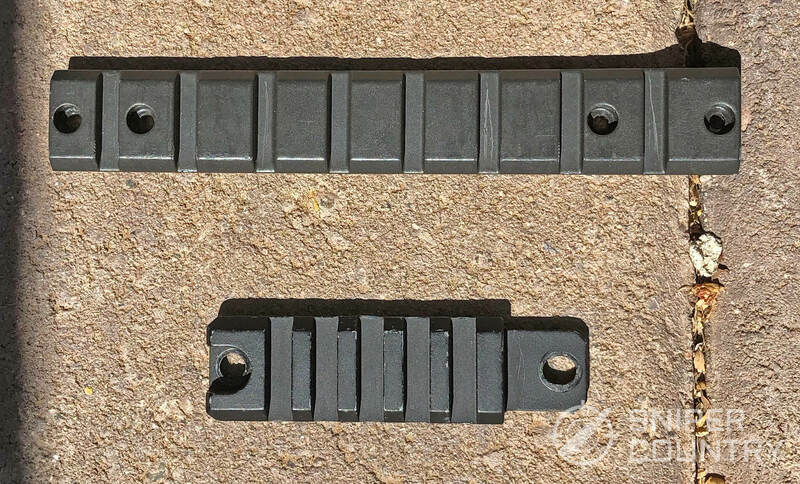 Most accessories originally designed for Weaver rails didn’t have a locking bar to help hold them in place, they relied on hex screws or thumbscrews which would tighten against the side of the rail. The increased surface contact helped with stability. It also helped prevent the scope from canting to the side when it was being screwed down, but it didn’t eliminate it completely. If you use a Weaver rail, it’s still a good idea to hold the optic in place to ensure proper alignment. This is a Weaver rail intended to be used with a bipod. Since bipods are designed to handle more load and normally have a much stronger locking bar style design, the need for more surface contact is negated. 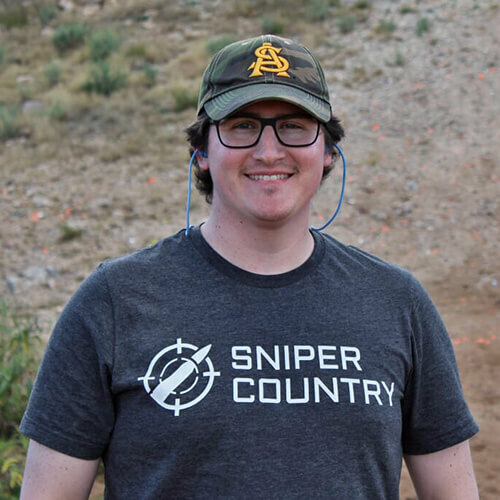 The space between recoil groves can be shorter, which is a benefit as closer spacing of recoil grooves means more and more incremental locations for the bipod to be positioned. These two show Weaver rails have changed as gun technology has improved, but their variability is also their flaw. Needing to have different rails for each accessory is mildly annoying for the average consumer, but for large organizations it can be a major frustration and logistical nightmare. That, combined with the problems that come from accessories designed for Weaver lead to demand for a better option. And with a little military intervention, a better option was born. Picatinny rails are based on Weaver rails and were designed to solve the problems associated with them. In many ways, Picatinny rails are more of a Weaver rail 2.0 than a completely new rail system. The specifications for Picatinny rails were officially released in 1995, after the US Military issued a request for a multi-use rail design. The Army had been experimenting with a rail equipped variant of the M4, the M4 MWS (Modular Weapons System) after the M4’s entry into service in 1994. The results were overwhelmingly positive, and the Army decided to equip all their M4s with rails, rather than have a separate model designated for them. The final testing and military certification was done at the military research facility Picatinny Arsenal, which is how the rail got its name. The official designation for the rail is MIL-STD-1913, and any manufacturer making a Picatinny rail must use the measurements outlined in that standard. 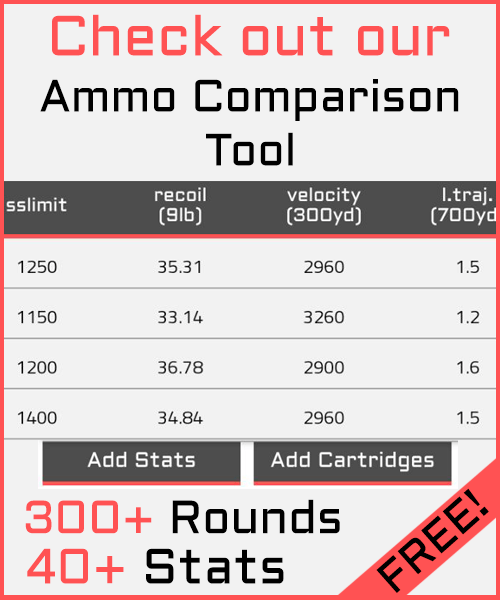 In order to meet the requirements, a rail must have a recoil groove width of .206” and a center to center distance of .349”. Other differences include a square recoil groove bottom, compared to the slightly rounded bottom of Weaver recoil grooves, and the method of attachment. Picatinny accessories are designed to slide along the rail before being locked down, while Weaver accessories are not. These measurements and differences seem a bit arbitrary at first, but the reasoning becomes much clearer when you compare the bipod Weaver rail to a Picatinny rail. The Picatinny rail is designed to be used with accessories that have a locking bar, which prevents the need for more surface contact, just like the bipod rail. The bar also eliminates the slight canting problem that can still occur with Weaver rails. The closer recoil spacing gives the user more minute adjustments for mounting, which is a big plus for optics and grips. 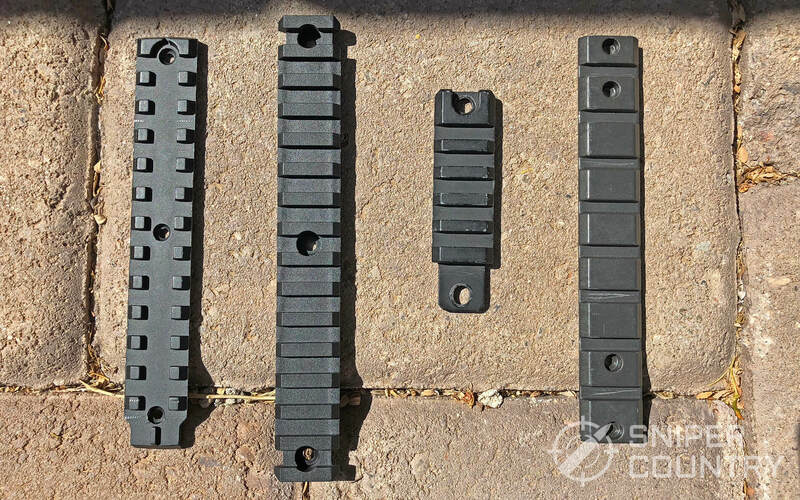 Many AR style rifles now come with the Picatinny rail milled directly into the receiver, which saves weight while eliminating the need to mount rails individually. Since modern optics tend to be a bit heavier than the scopes that came before them, every little bit helps. It also assists in keeping any mounted optic accurate since the rails can’t loosen over time, and it allows optic to be mounted closer to the bore axis. Picatinny rails have replaced Weaver rails in every corner of the market. When shopping it’s surprisingly difficult to find Weaver rails, most stores and online venders only carry Picatinny. There are still a few hunting rifles that come with Weaver rails mounted on the receiver, but they’re becoming increasingly rare. The military’s widespread use of Picatinny has played a major role in the fall of Weaver, but Picatinny’s takeover was inevitable. It’s just better. While having a rail on the bottom and sides of your AR is convenient, it isn’t very comfortable for prolonged firing. As a result, rail covers are a common sight on many rifles. They solve the comfort problem, but they aren’t always very durable, and they add extra bulk. Covers can also get in the way of accessories mounted on other rails. That brought about the next evolution in accessory mounting, KeyMod and M-Lok. Both use a slot system, rather than rails. They let you have a smoother surface to hold when firing while keeping the option to add accessories if needed. They usually come in a hexagonal or octagonal shape, which gives you many more mounting options than the typical top, sides and bottom of Picatinny and Weaver rails. Individual Picatinny rails can also be attached, which makes KeyMod and M-Lok backwards compatible with older rail mounted components. Despite that Picatinny will be around for a long time. It’s still the best system for mounting optics and is the basis for the rail design being considered for adoption by other NATO countries, called the NATO Accessory Rail. The measurements are virtually identical, with some tolerances increased. The schematics have also been converted to Metric, for the Imperially challenged countries of the world.